My allergies are kicking my tush. They’re so bad that they’ve literally had me walking around in a fog for the past few days. Let me tell you, allergies may not be really considered an “illness” but they sure do prevent you from getting stuff done. Thankfully they did subside a bit this weekend for me to be able to get a bit of recipe testing done! I also managed to make it out of the house to go to the “Spring Fling” with friends and I made it to a movie and dinner date with BigBear yesterday…although I wasn’t feeling 100%. Allergies = the devil. Like right now, I’ve had to take my contacts out this morning and I’m not stuck wearing my broken glasses while trying not to rub my eyes right out of my head. Lovely to picture that isn’t it. I’m sure I’m not the only one suffering though, so you probably know exactly how I feel. 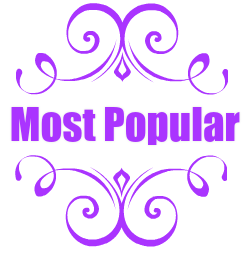 But enough about me. 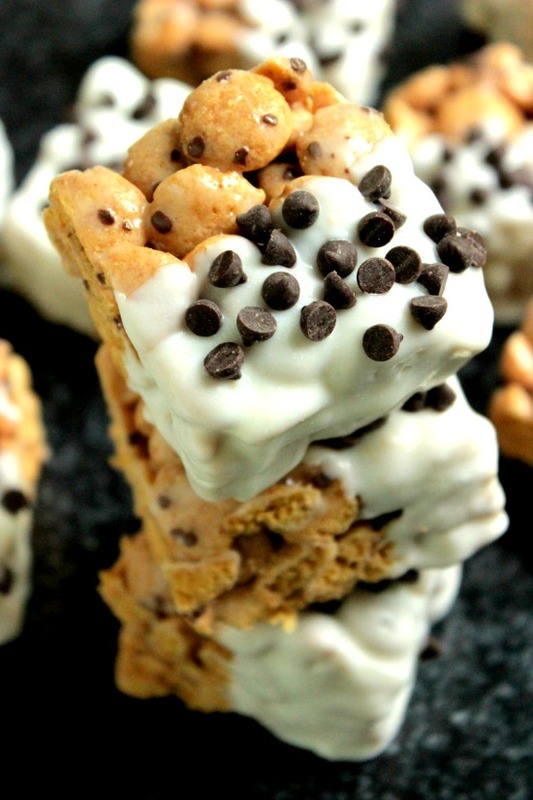 Let’s get onto these Cookie Cereal Marshmallow Treats. I’ve always had a strong love for marshmallow treats. 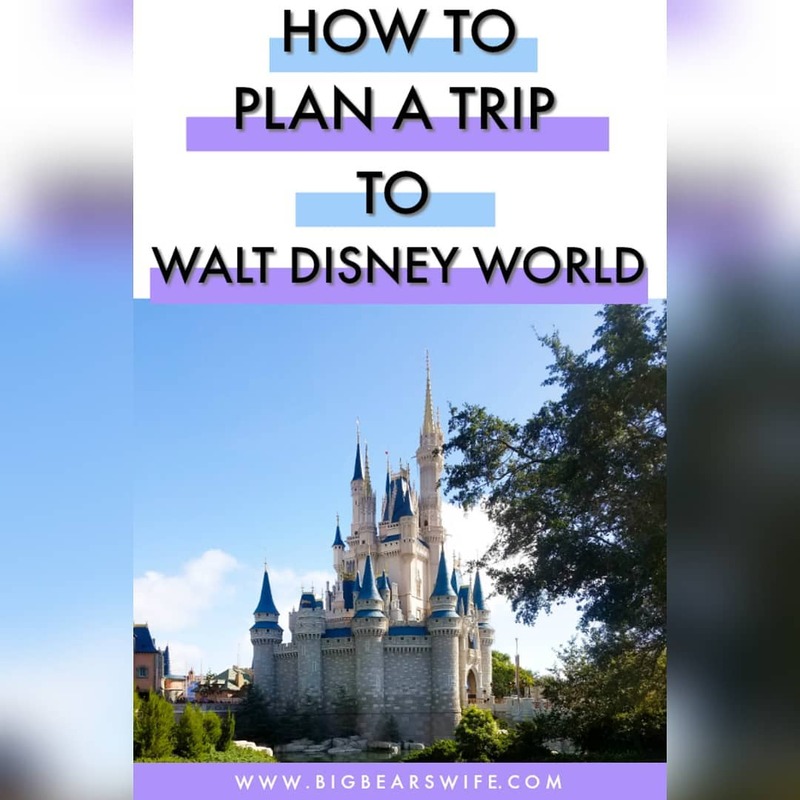 I warned you that you were going to start seeing a few more of them on the blog because this last year in my 20’s is all about making myself happy and well…..fun marshmallow treats make me happy. Also, I know we all grew up making marshmallow treats with rice krispie cereal but I’m here to tell you that it’s time to branch out! 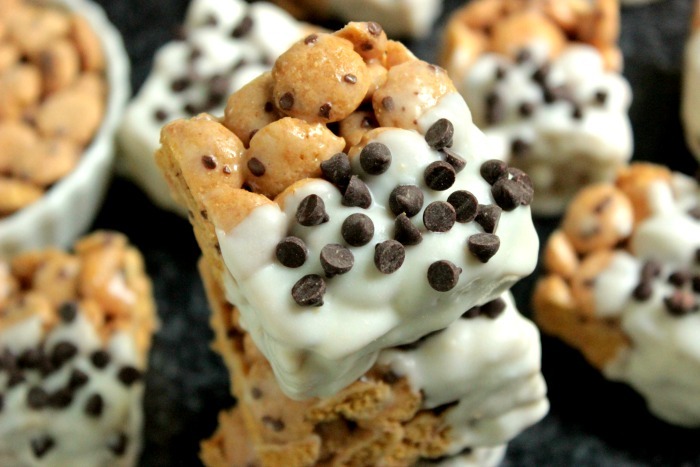 It’s time to try making marshmallow treats with other types of cereal. It’s time to cut them into fun shapes and dip them into chocolate and have fun with them! 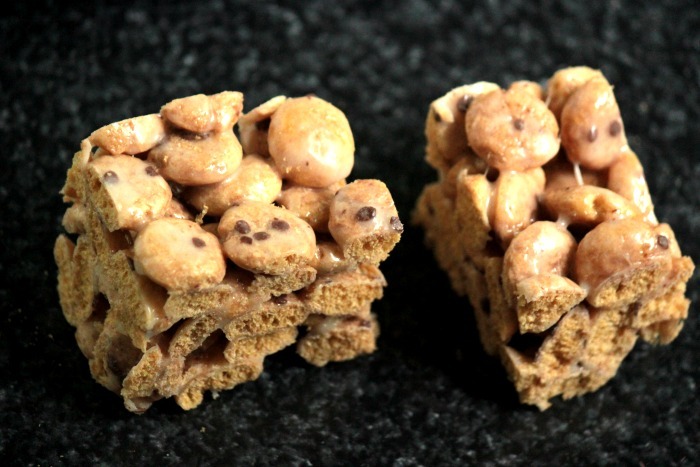 So today I’m bringing you Cookie Cereal Marshmallow Treats! 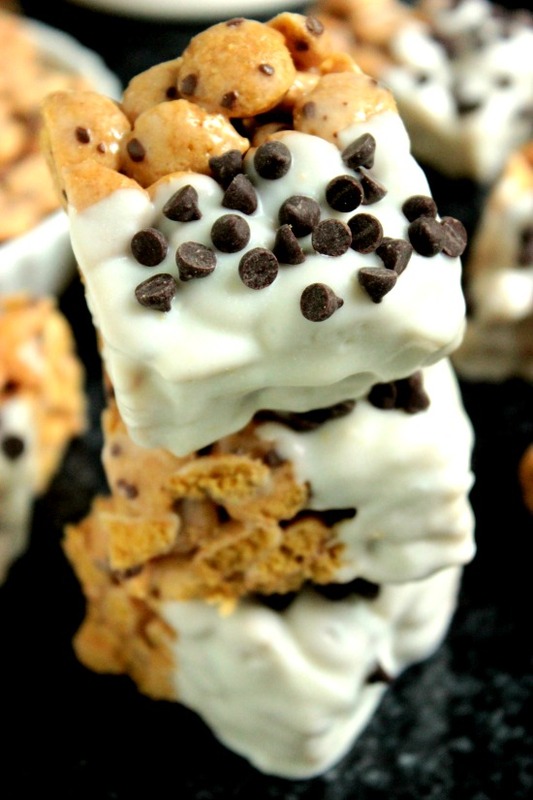 They’re marshmallow treats made with cookie cereal, half way dipped in white chocolate and sprinkled with mini chocolate chips. 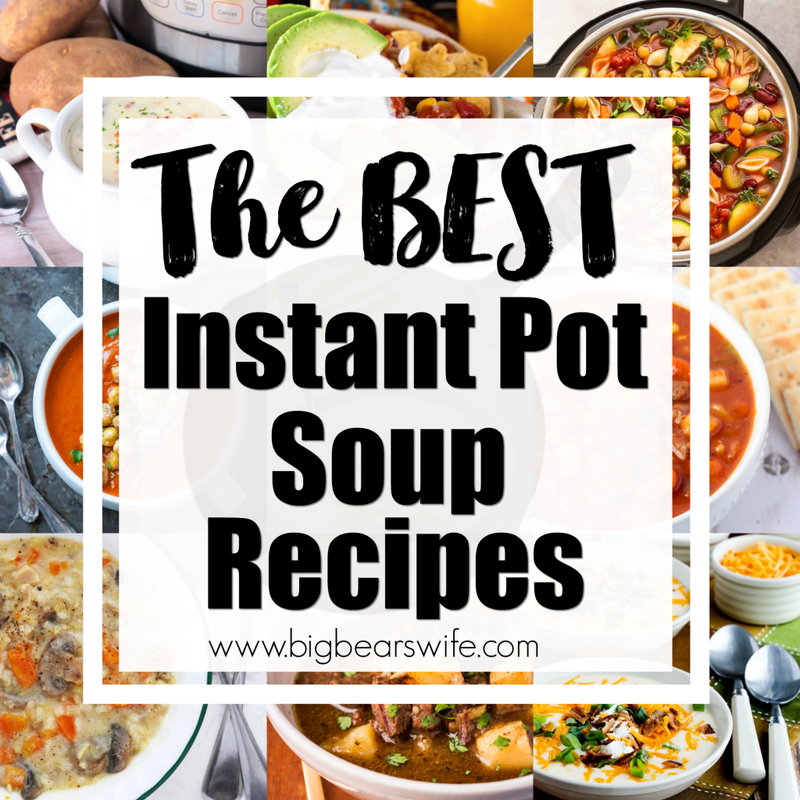 I even sent a dozen of these to work with BigBear and from what I hear his co-workers loved them just as much as I did. Now, I’m also assuming that BigBear actually shared these with this co-workers and didn’t just hide them in this lunchbox for himself. He promised that he shared and that they were a hit. Melt the butter in a large pot and add the marshmallows. Stir the marshmallows until they are all melted. Add cookie cereal and stir to combine. Press flat and let the cookie cereal treats sit for about 15 or 30 minutes. Melt the white Chocolate according the package directions. 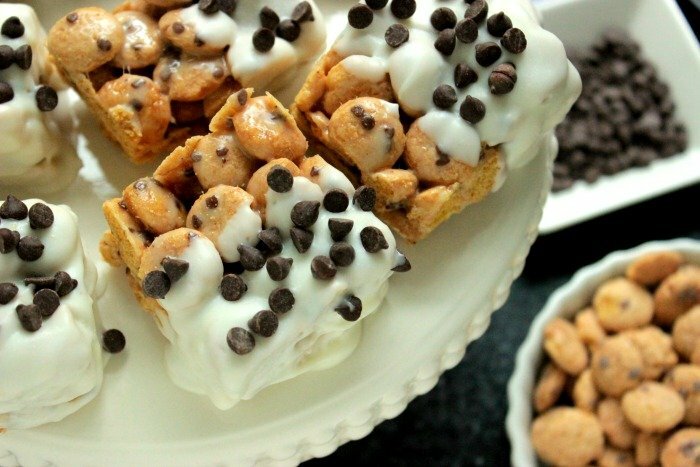 Dip half of each cookie cereal treat square into the melted white chocolate. Tap off the extra. Lay on a sheet of wax paper or parchment paper (or a plate), while the white chocolate is still wet, sprinkle on the mini chocolate chips. 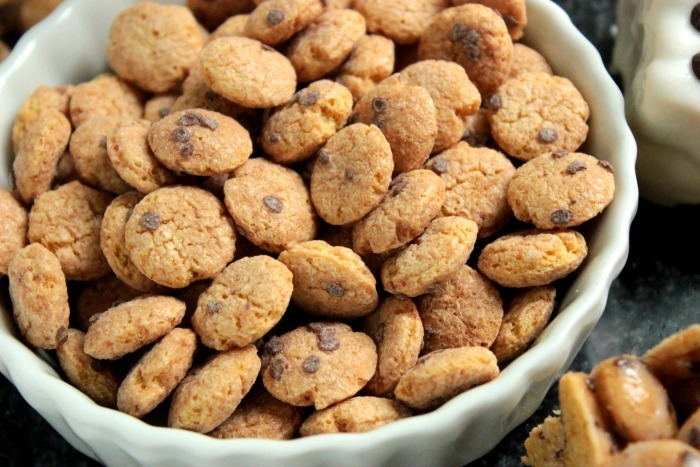 Let the cookie cereal treats sit for about 20 minutes undisturbed or until the chocolate has hardened. Girlllll, you’re killing me! These look deliciously delicious! Pinned! 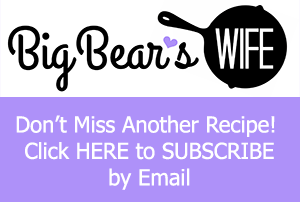 I love recipes involving cereal – they make me feel like a kid again 🙂 Hope you start feeling better soon! Allergies are the worst! 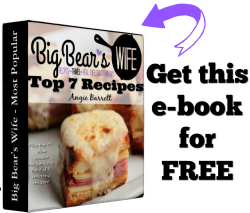 Now this is a fun recipe! My kids would love them! What child wouldn’t love these! WHOA! Now I am super hungry for these! What a treat! UGH so sorry about you dealing with allergies! We’ve also been dealing with it this time of year and it ain’t no fun at all! Thank God for Zyrtec, eye drops and nasal spray to get any work done at all! suuuch a creative spin! I really need to think about expanding my cereals for cereal treats! I’m in the same boat with allergies and contacts – they are not playing very well together lately! 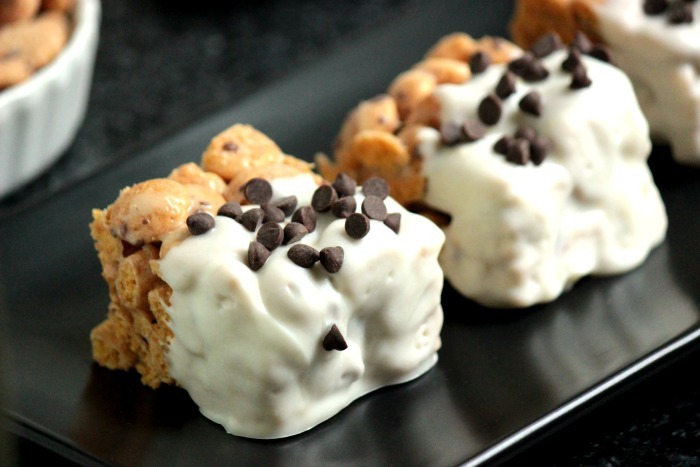 I am in love with these marshmallow treats and love that you made them with cookie cereal! Girrrrl! You just gave me a totally legit excuse to buy cookie cereal. Here’s hoping that I don’t eat all the Carl before making these fun marshmallow treats. I’ve been having allergy stuff and some days my eyes just don’t stop burning. Seems like marshmallows make every thing better, because these treats are sure brightening my day! I’m sorry that your allergies are rearing their ugly head…not the best part of springtime! 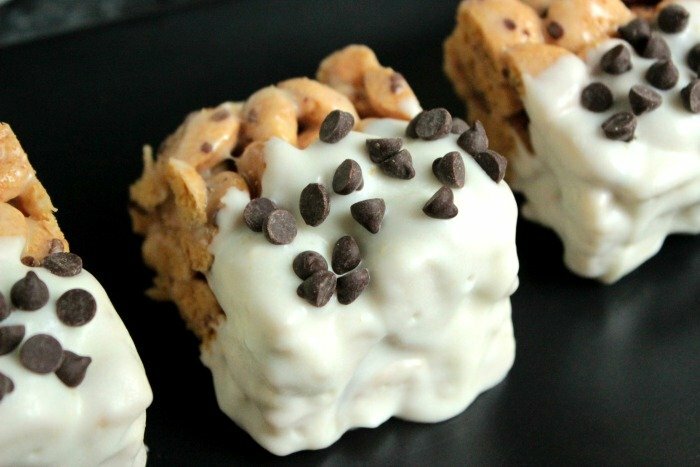 These marshmallow treats look like any kid’s dream. Yummy! I haven’t had cookie crisp in forever, and never would have thought to make these adorable treats with it. And I’m right there with you and the allergies. I can’t stop sneezing and coughing. And it’s not helping my pregnancy snore. I wake up to my husband literally like lifting my nose so I can get air. Not cute. Oh man, allergies are hitting hard in our house right now, too. My daughter is the one hit the hardest this time (she even missed school on Monday because her eyes and nose would not stop “leaking”…seriously, faucets up in that face). We love us some Cookie Crisp in this house, I have to surprise the kids with a batch of these. Okay I think these are perfect, but I’m a total cereal girl. It’s so fun to bake with. But boo on the allergies. That stinks. Hope it gets better soon. These would make any kids dream come true. I love that you dipped them into white chocolate for added interest and flavor. 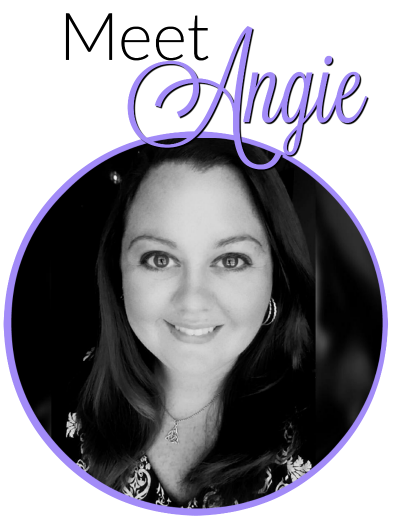 Feel better, Angie! OMG I cannot find cookie cereal around here. Must. Search. Now. Also allergies are the worst. I finally broke down and went to an allergist and it was the best thing ever. No more scratchy throat, itchy ears and constant fog.